This is actually an outdated photo - it shows the shawl as it was at around 30% done. It is now 58% done (row 147 completed, which makes 22,355 stitches in total). I can't get over how quickly it's growing! As one of my friends said, things always seem to go quicker the second time you knit them, and of course I'm using a slightly bigger needle (5mm instead of 4.5mm). 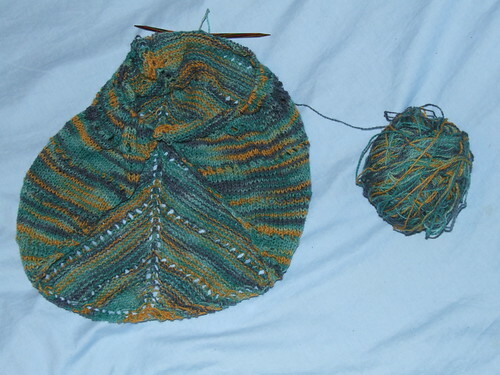 I am now at the end of the variegated wool, and I have to wait for the plain, toning wool to be dyed. I need another 100g to complete the last few rows of the body, and the lace border. The colours are actually brighter than they are in this photo. It's also difficult to see the shape, because it was taken mid-row (I'm using circs, working back and forth) - but I had to catch the Beamish Boy as he was passing, and ask him to take the shot before he got involved in something else! It's looking good. That sounds like a scary number of stitches to me!